Orga’s explosion proof external photocells provide automatic control of the marine lights, aeronautical obstruction lights and the helideck lights at dawn and dusk, when used in conjunction with the Navaids Central Control Panel (NCCP). The photocell measures the outdoor light level and relays this information to the NCCP, which subsequently controls the activation and deactivation of lighting fixtures at dusk and at dawn respectively. 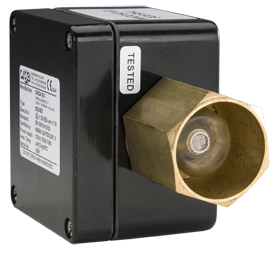 Why do you need an explosion proof photocell? Essentially a peripheral device, the photocell is mainly needed for security purposes. The adequate marking of man-made offshore platforms is vital to ensure the safety of navigation and to protect the structure and its personnel. By determining the level of available light, the photocell will ensure that your platform or rig will be automatically illuminated and visible to shipping at dusk, at night or during periods of poor visibility. Thanks to the control provided by the photocell, the average life of the light source will be extended and power savings will be being made. 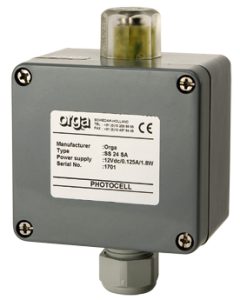 Why choose explosion proof external photocells of Orga? Our latest offshore platform marking and warning system provides a reliable, durable and cost-effective digital solution for the demanding global offshore energy industries. Our explosion proof photocells offer you a combination of reliability, safety and low cost of ownership. Moreover, the compact design and non-metallic body of the photocell houses a spacious cable connection compartment and is suitable for use in Zone 1 and Zone 2 gas explosion hazard areas.